Who is the best of the best? KyritsHicks split into two teams and finish one and two, you know, just to take the piss. 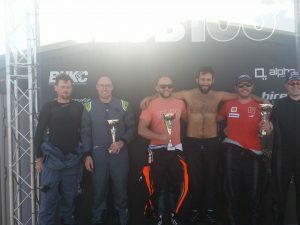 With the championship already wrapped up and the maximum score achieved, KyritsHicks decided not to enter the race as a team but compete as two individuals and iron man it. Basically they were just taking the piss. 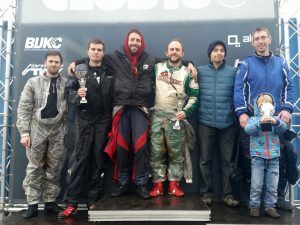 The morning rain had long since cleared by the time the afternoon races started but turns one and two were still very slippery and the dry line was almost in Rochester. 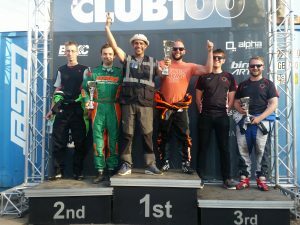 M&M were the highest placed class 1 team for the opening heat but they dropped back at the start behind the flying Scuderia GM, Racecraft and Going HAM. Scuderia GM picked up the lead early on and held it for the first half of the race. The Greek half of KyritsHicks was closing fast and took the lead on lap sixteen, shortly followed by G3Pro. Having started down in nineteenth, Maxx MPH were on a charge and in the top ten by lap two. Over the next few laps they caught up to the tail of the leading pack, having dispatched Old Men Racing, the non Greek half of KyritsHicks, Clunge and DGB. There were a couple of horrendously slow karts out there and this may have been the cause of Kosta’s penalty – overtaking under a yellow flag. While he crossed the line in first place, he was handed a four place deduction. This handed the win to a grateful G3Pro. Scuderia GM came home second, HAM third and Kyrits fourth (behind JEN Racing). Maxx MPH completed the top five. Keen As Mustard’s day came to a premature end when a wheel fell off. The battle for race two was between Kyrits Racing and Hicks Racing. The newly crowned champions going head to head in the latter stages. Kyrits started from 25th place so had to work his way through the field, while Hicks started eleventh. In terms of the battle for third in the championship, disaster struck Maxx MPH. Needing to change their kart late in practice due to engine gremlins, they were put out in a spare kart that had been set up for the wet. Unable to do much with it, they pulled into the pits to get the carb tweaked, emerging dead last. Meanwhile, their main rivals were struggling to make much progress and were languishing down in the midfield. Although G3Pro had led for much of the early race, they were overhauled by Hicks Racing. Kyrits also got passed and began closing the gap to Hicks. Although within striking distance, they ran out of laps. So it was legally one-nil to Hicks. 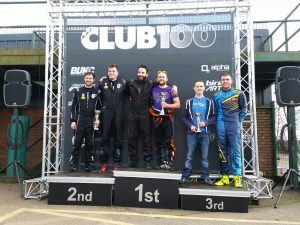 G3pro were third, Old Men fourth and racecraft fifth. Scuderia GM only managed to finish ninth. 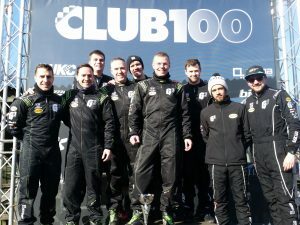 A front row starting position for Kyrits Racing made victory almost inevitable. However, a fast starting Maxx MPH from sixth on the grid saw them jump into second at the start and chase the leaders down. However, for the second consecutive race, mechanical gremlins crept in and threatened to end their hopes of a top 3 championship position. On lap four their engine began to tighten and hesitate up cafe curve and the end of the main straight. They somehow managed to hold on to second for several laps before being passed by main rivals Scuderia GM, eventually dropping to fifth. Kyrits stormed to victory with Scuderia GM coming home second and keeping their chances of third alive. 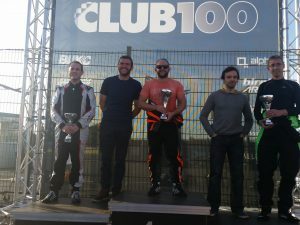 Hicks Racing came home third and racecraft were fourth. Maxx MPH somehow managed to nurse the lart home in fifth. Hicks Racing started the final race of the day from the front row. They came under a lot of pressure from a couple of class two teams throughout but managed to hold onto the class lead. Kyrits soon started working their way up from grid twelve to close in on the leading group. 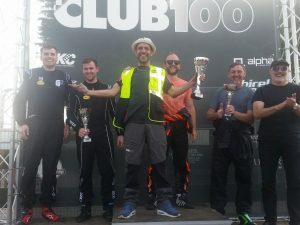 There was an intense battle going on further back between Old Men Racing and Maxx MPH Racing – the latter soon getting ahead before both were passed by Kyrits. 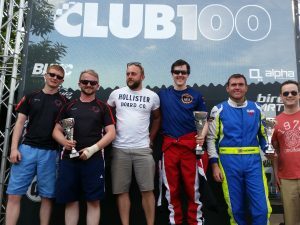 Further back, Team DGB, Big Cat Motorsport and Keen As Mustard were squabbling over the lesser positions. Scuderia GM were also in the mid field and, for the second race of the day, struggling to make much progress. Back at the front and Hicks was fending off the attentions of the class two teams but managing to stay ahead of his former team mate. Maxx MPH were next up and maintaining a small gap over Old Men Racing. There was then quite a big cap to the rest of the field. 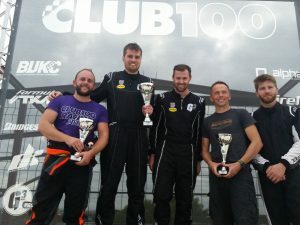 So at the flag it was Hicks Racing who took the win, half a second clear of class 2’s team JAWS. Kyrits was a handful of seconds back but took the runner up spot. Maxx MPH came home third a few seconds further back and, with Scuderia GM only managing ninth, this was enough to give them third overall in the championship. What legends! So who would take the overall win? There was a lot of pride at stake. Who would emerge as the best driver out of KyritsHicks? Well, had it not been for his penalty in the first heat, Kosta might have done it. It couldn’t have been closer in the end as the two tied on points. Hicks took it by virtue of having more wins on the day. Kosta had to settle for second and will have to spend the rest of his days in the knowledge that he is a number two. That will probably begin to grate after a while. 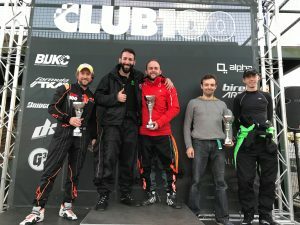 G3Pro took third and Scuderia GM and Maxx MPH taking fourth and fifth respectively. It’s been a truly dominant year for Steve Hicks and Kosta Kyritsis. 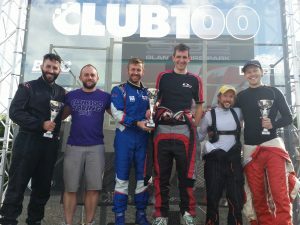 Between them, they have won fifteen heats each, taken a maximum score and finished second or higher in every single race. Not since the days of Marc Craddock in his prime has Club100 seen such dominance. What does 2019 hold for these two? Watch this space. Oh and well done to everyone else as well.